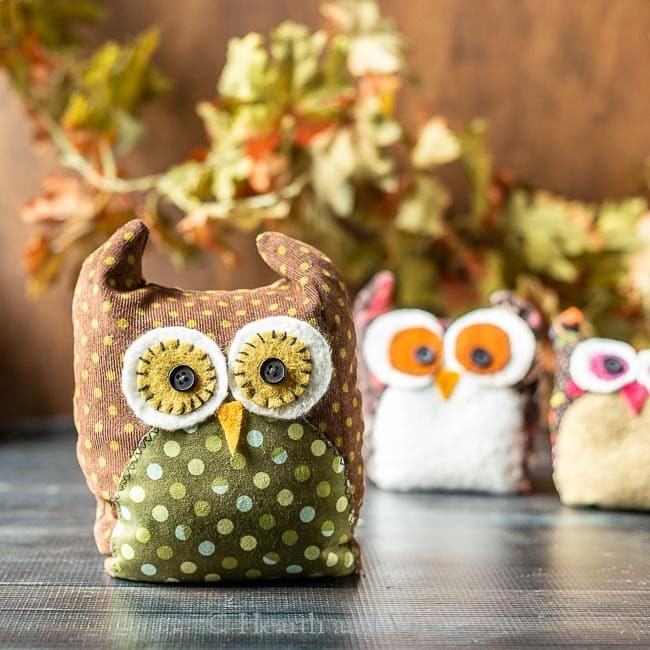 Learn how to make these adorable fabric owls with leftover scraps from your sewing projects, and a free printable pattern. 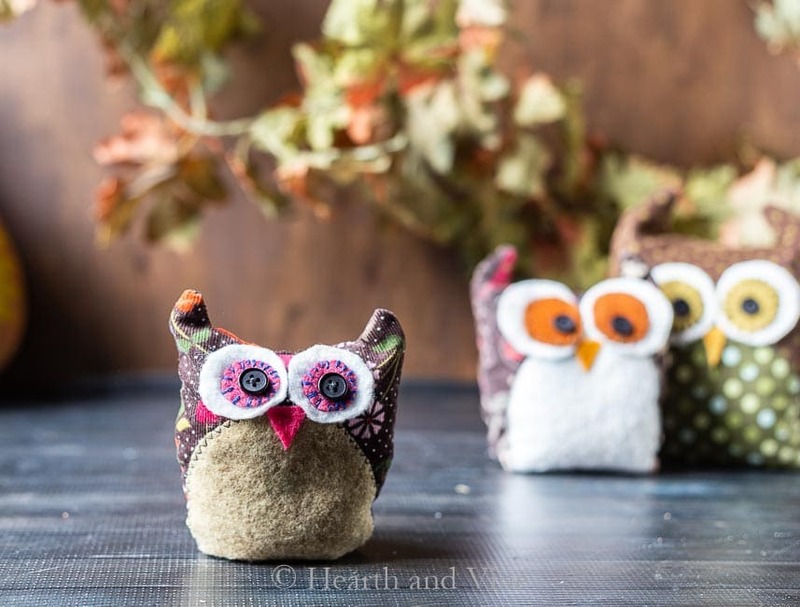 There’s something about owls and the fall that make the cutest decorations. I made this trio one afternoon and they turned out great. Here’s how you can make some for your own home. This is the template I used to create the owls. You can find the free full page PDF version here. First, pick out some coordinating fabrics and felt. I used quilt batting for this one’s belly and all of the white eyes. 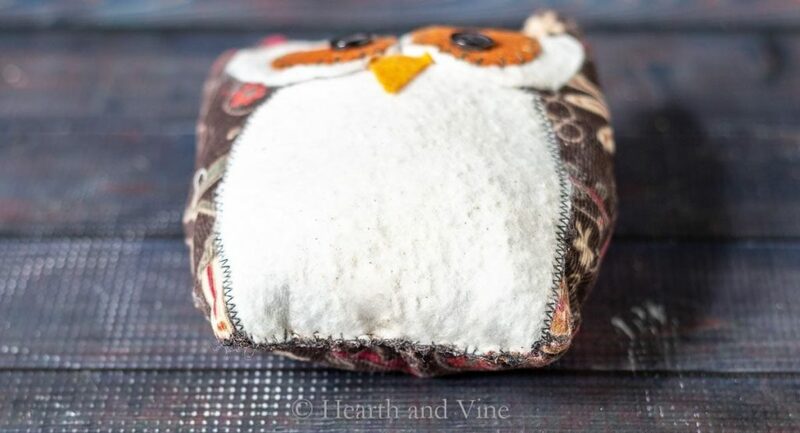 Sew the owl parts to the right side of one of the body pieces. I used the sewing machine to sew the belly to the body with a zigzag stitch. However, you could hand stitch the pieces onto the body. Or, use fabric glue . In fact, I used fabric glue for the beak. The eyes were held into place with a little 7/16 inch black button . For added dimension and whimsy I used some embroidery floss to sew around the inner eye with a contrasting color. Once the body parts are on you can match up the two body pieces, with right sides together. Sew all along the outside edge, leaving the bottom open for turning. Turn right side out and prepare to fill the cavity. To fill the owl use something like fiberfill or this crushed walnut shell material. I got the idea for this material from my sister’s daughter-in-law. She had some new velvet pumpkins that were heavy and I wondered what was in them. After some research, I found that the crushed walnut shells are used for pincushions. It makes the owls sturdy and helps them stand up straight. You could use sand but some suggested that it’s a little too messy. If I had some sand on hand I would have probably used it though. Once I used birdseed for some snowmen but that was a mistake because we stored them in the attic and something, I don’t even want to think about what, got into them. Fill the owl’s body until it is totally full. It takes a bit of patience and practice. I might even suggest filling the ears with fiberfill first. Finish by hand stitching the opening closed. The first owl is made with the template shown above. To make one a little larger simply extend your cutting lines beyond the template about 1/2 – 1 inch. I did this for the body and the belly but left the eyes the same. 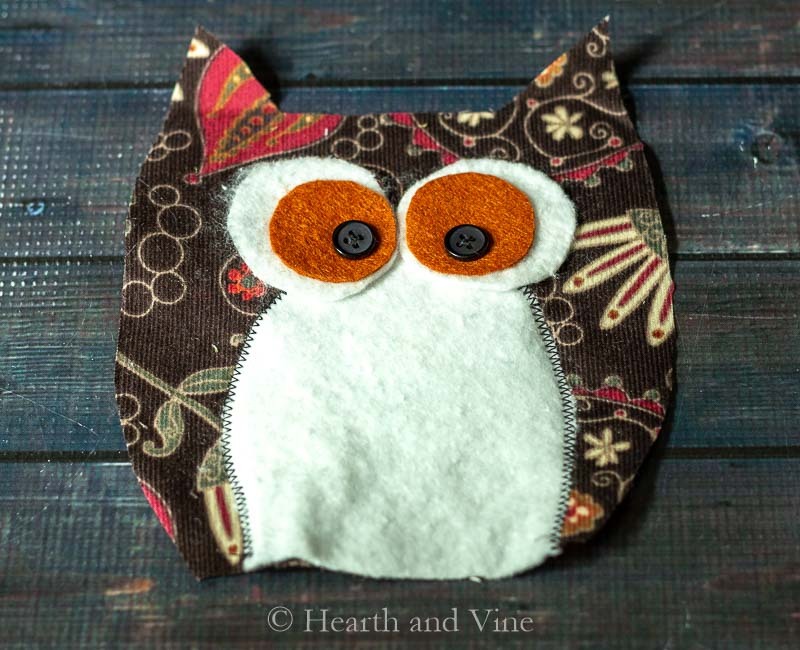 The same goes for making this smaller owl. Just trace the template but cut inside the lines. On this one, I used the small eye template for the larger eyes and then cut smaller ones, along with the body and belly. 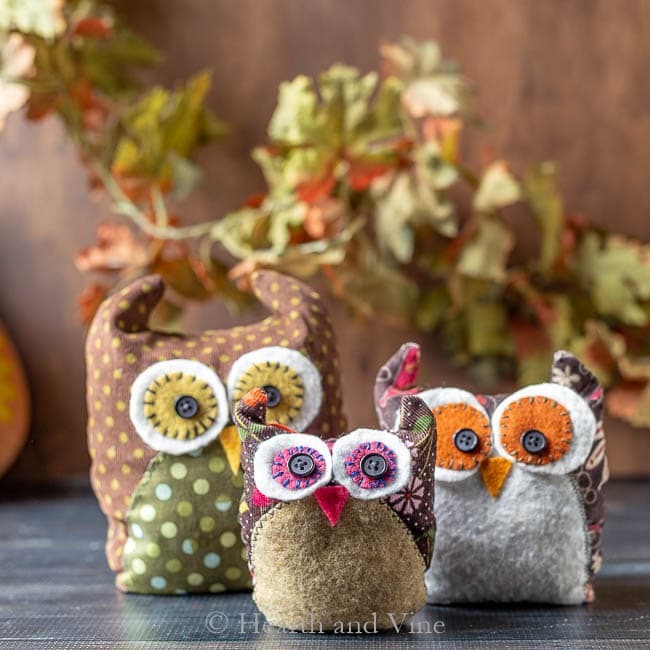 This little family of fabric owls is perched on our mantel to help us celebrate all things fall. They will be there through Thanksgiving. 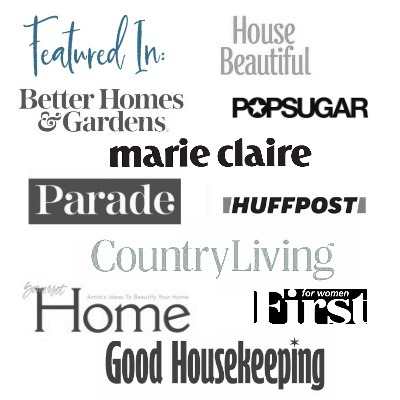 Stop back to see them along with another fun fall project on the mantel in the next post. These are so very cute!! I love Owls, thanks for the pattern, you did a great job! Thank you for such a kind comment Robyn. I hope you have as much fun making them as I did. These are so cute and clever. When I was a kid my sister made stuffed frogs with those google eyes. Anyways they always filled them with sand. So the one with the pink eyes is my favorite, great way to spice up fall with a different color. LOVE! Thanks Carole. Frogs would be cute too. Might have to keep them in mind for the future.